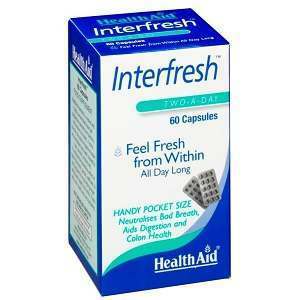 Interfesh Capsules from HealthAid are a blend of natural oils meant to help freshen breath and remedy digestive troubles at the source. It claims to remedy bad breath created by strong-smelling foods, and halitosis caused by dental problems, illness, or other factors. Safflower oil is primarily the carrier oil used to bind the other ingredients together inside of the capsule. It is widely used as a heart-healthy oil and has been shown to lower cholesterol with mild use. Parsley seed oil is antimicrobial and antiseptic and has been shown to act as a mild diuretic, and digestive aid. It has natural carminative properties that can remedy digestive troubles including nausea, flatulence, and bloating. Peppermint oil has been used historically for a number of digestive issues including indigestion, bad breath and gingivitis, IBS, and others. It also helps to balance the microflora in the intestines, leading to improved health long-term. Chlorophyll is full of essential vitamins, minerals, and antioxidants, and has been shown to help balance the microflora inside the body, inhibiting the bacteria that cause bad breath and upset stomach. Bad breath can also be a sign of unbalanced internal systems, and chlorophyll can help to remove toxins and rebalance the system. Menthol can help to cleanse and remedy bad breath, and it also creates a pleasant, cooling sensation. The capsule shell made of gelatin, glycerol, and purified water meaning that this product is not suitable for vegetarians. HealthAid recommends taking two to three capsules daily with water after meals, and preferably in the morning. More can be taken if required, up to three times daily, but not exceeding nine capsules total per day. If you find you are using Interfresh Capsules for an extended period to address bad breath every day you should seek medical attention to make sure the cause is not an underlying medical issue. Those with stomach disorders like ulcers or IBS should consult a healthcare professional before use, as should women who are pregnant or breastfeeding. Safflower oil can cause nausea and diarrhea in large doses, as well as occasional headaches and loss of appetite. In large doses, parsley oil can cause low blood pressure and other serious neurological effects. Peppermint oil can cause occasional heartburn, and more serious problems if allergic. Chlorophyll can cause a mild increase in sun sensitivity, but only in rare cases. You should avoid this supplement if you are allergic to any of the ingredients. HealthAid sells a packet of 60 capsules for $8.57 through their website. Through Amazon, they can be purchased for $9.99, and as low at $9.70 from VitaNaturals. There is no product guarantee, but HealthAid has a reputation going back over 25 years in the supplement market. Customer reviews are quite split, with over half reporting positive results as promised on the box, and about 30% unhappy with the results of the supplement. The long reputation of this manufacturer, and the proven ingredients that aid in digestion and remedy bad breath make this comparable to many supplements on the market. The mix of five-star and one-star reviews seem to indicate that this may be a ‘hit or miss’ product that works well for some and not for others. The lack of guarantee is another downside of this product. Tim McClure	reviewed HealthAid Interfresh	on January 14th	 and gave it a rating of 3.